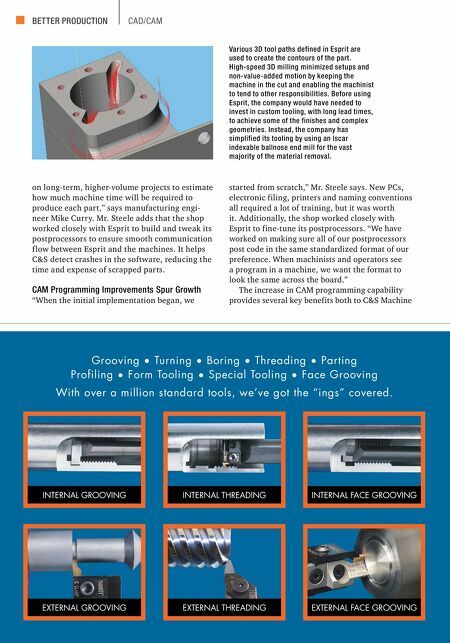 MODERN MACHINE SHOP 83 BETTER PRODUCTION CAD/CAM PROFILING PARTING SPECIAL TOOLING BORING DOVETAIL FACE GROOVING FORM TOOLING 888 - THINBIT • 888-THINFAX • THINBIT.COM Made in the U.S.A. Since 1964 and its customers. For one, more efficient CAM programming workf low helps reduce program- ming time. For another, the automated strategies provided in Esprit reduce cycle time, which in turn helps reduce the cost of machining. Realis- tic simulation and accurate postprocessors have eliminated problems such as crashes when run- ning programs for the first time. Operations manager Tom Grace says, "There are many factors involved in our growth, includ- ing investments we have made in new technology and workforce development, and the dedication and support of our entire team. But there's no question that the improvement in our CAM pro- gramming capabilities that we have achieved with Esprit have played a major role in our success." | C&S Machine & Manufacturing Corp. | 502-778-4479 csmachinemfg.com | DP Technology Corp. | 800-627-8479 dptechnology.com Pictured here are some of the team members from C&S Machine and Manufacturing in front of one of the shop's 30 CNC machines. 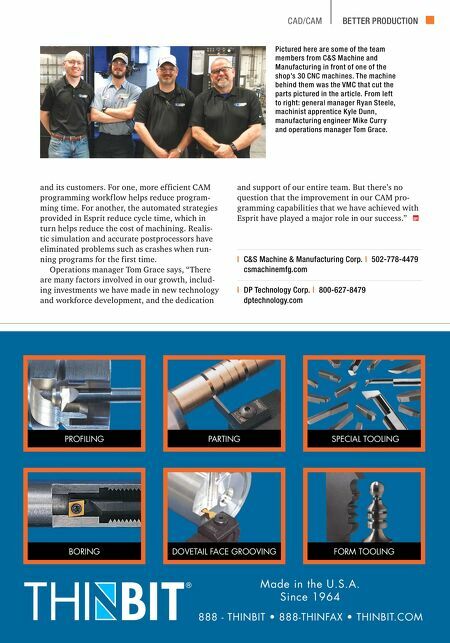 The machine behind them was the VMC that cut the parts pictured in the article. From left to right: general manager Ryan Steele, machinist apprentice Kyle Dunn, manufacturing engineer Mike Curry and operations manager Tom Grace.